Italian Easter Bread (Pane di Pasqua)is one of our all-time favorite breads! 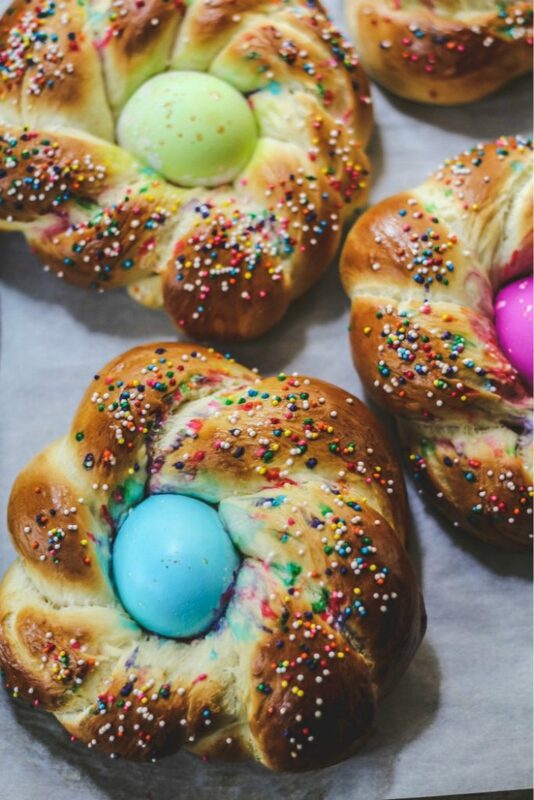 It seems to never fail that when I’m finally over the shock of a new year beginning, it is already time to plan for Easter and to bake some Italian Easter Bread (pane di pasqua). And when I say plan, it’s usually all about our baking production!! I couldn’t wait to tackle this lovely Italian Easter Bread (pane di Pasqua) another time. It’s a recipe I’ve been making for years. It’s a recipe my mother-in-law makes for us when she is here visiting from Italy for Easter. She is not too much into the colored eggs or even the sprinkles. But she does know how to make some really cool designs and shapes. She cranks out this bread and I am finally starting to catch up with her speed, well, just a little. We were so lucky to have my in-laws spend a few Easters here with us. Since we couldn’t go to Italy, it was just as good to have a little taste of Italy here as soon as they arrive a the airport. My mother-in-law is just the best! 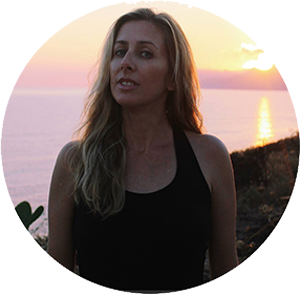 She barely brings any clothes (totally no-fuss, low-maintenance kind of a lady)and brings a suitcase just FILLED with goodies for all of us. And I mean, GOODIES! When I say goodies, I mean just food things. Like pasta and different chocolate. She brings us various canned goods that she makes. Oh, and a ton of hot peppers she grows! She makes a sauce with them and also brings them whole and dried. There are still some left from their visit to us last April. Since my in-laws couldn’t make it to visit this year for Easter, I had to get started a little early on the baking! Because the kids were wondering when we would color eggs and when they could shape their own rolls. The bread is so wonderful, my mother-in-law does make it even in the summer when we are there (minus the eggs). It’s the perfect bread to enjoy with a hot cappuccino! 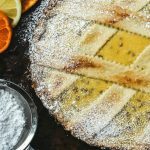 Another wonderful Easter idea is a Pastiera Napoletana. It is quite a pie! Not a typical American pie, by any means. It’s made with a pasta frolla dough and the filling is rich ricotta and another surprise (hulled wheat berries)! Some notes: When you make the ropes, make sure you don’t make them too long, otherwise your little nests to hold the eggs will be too wide. 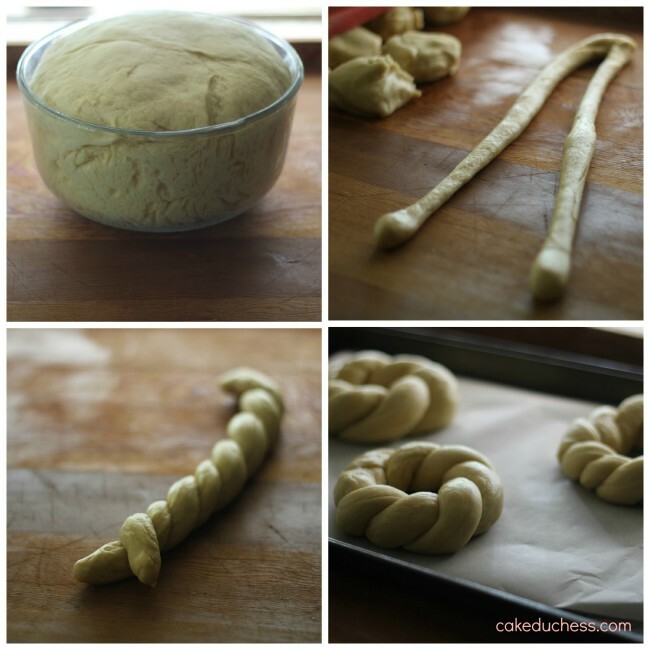 The dough ropes do shrink as you roll them and then shrink again when you stop. I would measure them and make sure it’s not over 12 inches long. If the ropes are too skinny, the nests will be too wide. Flour: I use between 4 1/2 and 5 cups of flour, never more than 5 cups. If you add more than 5 cups, the dough will be too dry. I do mention in the recipe to start with 4 1/2 cups and add a tablespoon more of flour at a time until it is a pliable dough, not too sticky, and not dry. For the sweetness, 1/2 cup of sugar is perfect for our taste. You could add another 1/4 cup if you like your dough more sweet. You could also add a powdered sugar glaze on top after baking and add sprinkles on top (if you do the glaze, don’t add sprinkles before baking). The sweetness depends on your taste. 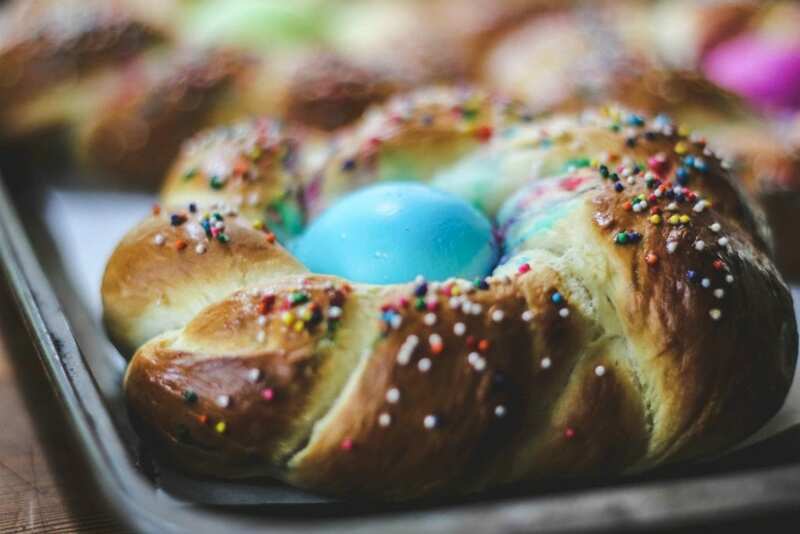 * I slightly edited this post of this gorgeous Italian Easter bread from last year. I hope you bake it this year!! Italian Easter Bread (Pane di Pasqua)is one of our all-time favorite breads! 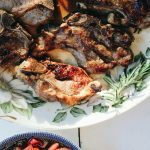 My Italian mother-in-law gave me her recipe and it was one we make every year and is a family tradition. f you are adding colored eggs, now is the time to color them. Follow the dye directions on the box or use natural dye and let the eggs sit for an hour. The longer they site the more vibrant the color. Hold onto your mixer! Now you will add the butter 1 tablespoon at a time. I tell you to hold onto it because it will move around if you are mixing it on too fast of a speed. Start on medium-low speed. If you notice the mixer moving too much, you can lower the speed and let the butter get gently incorporated into the dough. If you have the mixture at a faster speed at this point…do not leave it alone while it’s mixing. It could bounce off the counter. Start with two pieces: pinch the ends together of the first 2 ropes to secure the strips together Bring one side over to the other and tuck it in to make a small ring shape. You’re making a little nest for your colored egg to nestle into. Make sure your ring is not too big and not too tight. Repeat process with the next 6 sets of 2 ropes that you will make. You will have 7 little nests to hold your eggs. Place on two baking sheets lined with parchment paper (or a silpat mat). In a small bowl, whisk together the egg and water for the egg wash. Brush on the egg wash. 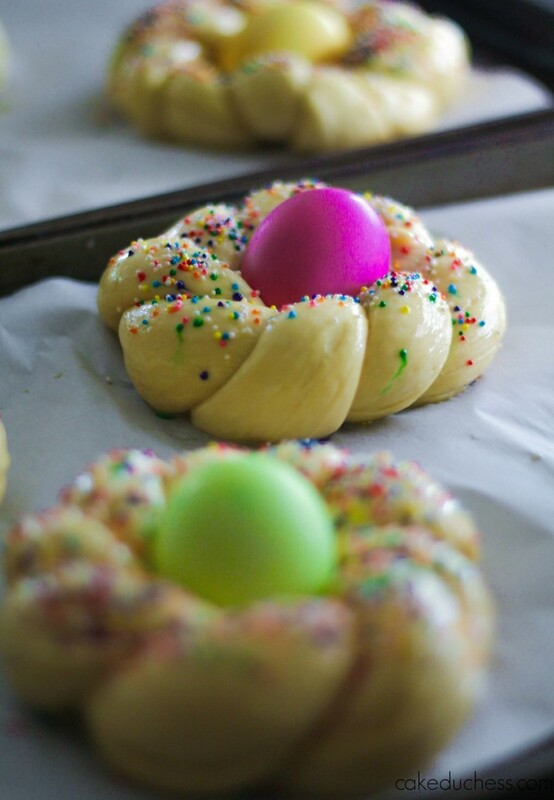 When dough is ready to bake, brush on some more egg wash. Sprinkle on the sprinkles. Place an egg in the middle of each little nest. Bake for about 18-20 minutes. If you are making one very large wreath, it should be done in 25-30 minutes. Don’t forget to eat the yummy eggs that are baked in the middle of the bread. My kids fight over them! In order for the raw eggs to cook, they will need 18-20 minutes in the oven. If you prefer to add eggs already cooked, hard boil them and color them (according to color instructions)and add them already cooked to the bread. *If you have left bread out with eggs for a couple hours, just discard the eggs, and eat the bread. Beautiful bread. And I bet it tastes good, too! My friend makes a braid rather than rolling. Like you said, there are many different shapes. Can't wait for next Easter to try your recipe! My mother made this every Easter. When she passed I couldn’t find the recipe. I am so happy to have this one. I’m so happy you will make this special Easter bread. Sending you many hugs! These look so cute and so perfect for Easter table. I always buy those in store. But this Easter I will make it homemade. Thanks for the recipe! 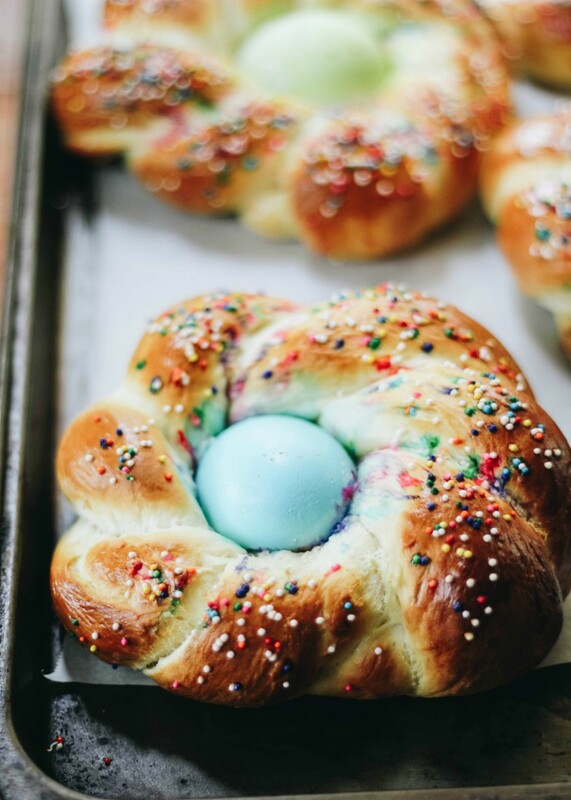 This Easter bread is so cute. I am sure it’s very tasty too. I would like to have one for Easter! I followed your recipe and I loved it! It’s one of the most tastiest bread I ever had! These are lovely. I love this bread, and have not made it myself. This recipe looks like a fantastic place to start. This is such a beautiful bread and it will be so much fun baking these with my boys. 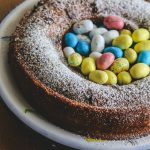 Perfect for the Easter brunch and love that you bake the eggs with the bread. Thank you, Sandhya! Yes, it makes it easier to make and the kids love to eat the eggs! 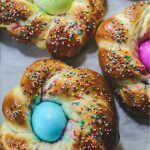 I too made Italian Easter Bread I love making them, your recipe is great too. Ciao Francine-I’m happy you found the recipe easy!! That makes me happy! If you’re making the smaller nests you could check on them at about 15 minutes. Every oven is different. I stay in the kitchen and glance at them usually around 15 minutes. But my oven has them ready at about 18 minutes. We are excited to bake them this weekend again! Happy Easter!! Such a great idea for Easter! I’m going to shoe horn this in to my Easter baking extravaganza tomorrow. Love Easter bread so much! This is always a must make this time of year! 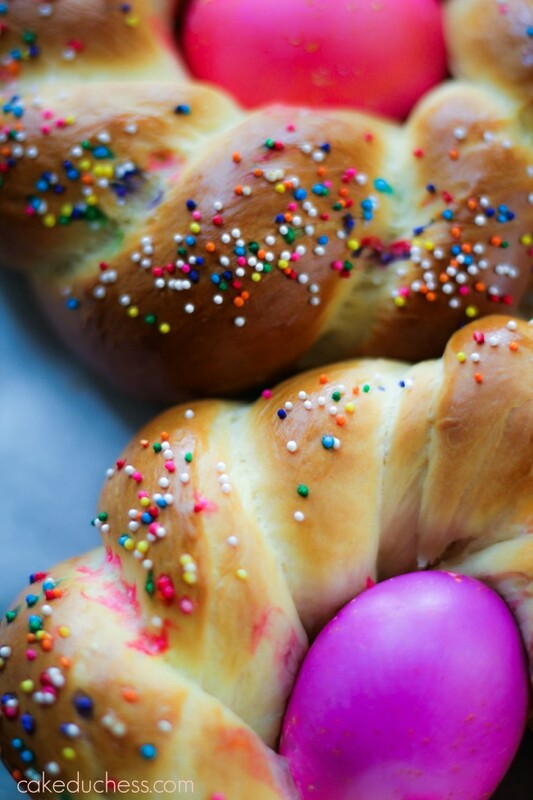 Your Easter Bread is so beautiful! Thank you for sharing this with us. Easter Bread is on my to do list since I haven’t made it before.